Property maintenance in the Aldergrove area can be broken down into the everyday, the annual and the on-call. Keeping any property in good, clean condition takes effort but multiunit properties are in a league of their own. Exterior maintenance needs are easy to spot but low-traffic areas are harder to address. No strata property is complete without a working laundry room but keeping tabs on appliances can be tough. A clean vent system can make a world of difference to drying times, while preventing health hazards like dryer fires. 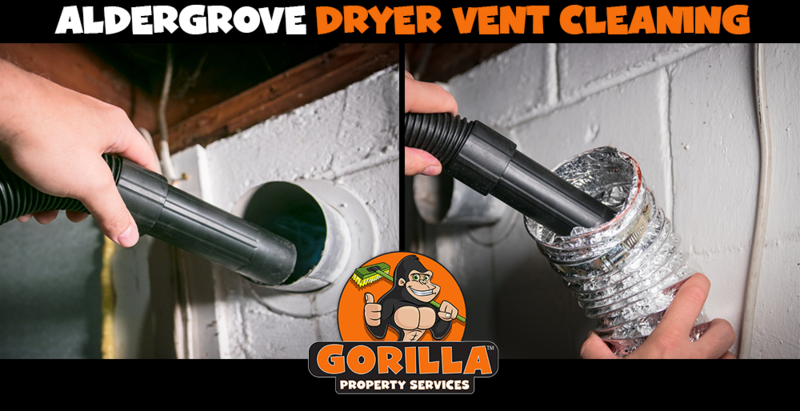 Instead of letting leftover lint clog ducts and airways, call a Gorilla for your Aldergrove dryer vent cleaning. Ventilation systems come in all shapes and sizes. Any sort of appliance, from dryers to air conditioners needs an outlet to for exhaust. Appliances are designed to make life easier for property owners or managers, maintaining them can be inconvenient – to say the least! Blocked vents can annoy tenants, strain machines, and rack up electricity bills. A proper Aldergrove dryer vent cleaning confronts unwanted buildup within every part of your system. Reaching in at arms length to grab lint and debris doesn’t do much to empty out the more vulnerable parts of your dryer vents. In fact, these sorts of amateur practices for duct cleaning can lead to more damage. Running on the assumption that systems are cleaned out when they haven’t been, makes way for unseen blockages to build and build. For the most part, these blockages are made up of dryer lint, which in itself is a fire hazard. Aside from the added threat of fires within your vents, clogged exhaust pipes are a nuisance to your tenants. Fire hazards might be the first threat to come to mind, but blocked vents can do more than just that. Sometimes, the most dangerous aspect of a damaged appliance is quiet. Air quality, for example, is a major safety concern in shared areas. Dryer debris is not often made up of breathable material. As damp air keeps circulating in these areas, it opens the door for mould to grow. If dust, dirt and mould are allowed to pile up on one another, it makes for an unsanitary environment. With nowhere to go, the recycled air from dryer ducts is put back into your laundry room, ruining air quality. Professional dryer vent cleaning takes all the risk out of cycles. Dryer duct cleaning might not be a common chore – but it should be! In the same way that dryer lint collects inside traps, debris builds inside exhaust vents. Whenever an appliance is purchased, it comes along with instructions and manuals for proper maintenance. Far from easy maintenance practices on small appliances, maintaining the components of your clothes dryer is much more involved. While some appliance maintenance issues are contained to one arena, dryer ducts collect lint and debris throughout the year. Basic residential laundry facilities collect materials slowly, over time but multiunit properties are at higher risk. With dozens of loads going through laundry systems daily, small bits of debris add up quickly. Removable lint traps are designed to catch the majority of debris that is spinning around your system, but they can’t stop everything. As small amount of lint squeeze passed these traps during one load, this is amplified by high-traffic, communal use. Routine dryer duct cleaning improves drying cycles, air quality and saves money on electricity. When dryer exhaust is unable to pass freely through systems, it creates added pressure on machines. With hot damp water recirculating inside your dryer, it is no wonder that clothing is unable to dry out. The more clogged that your vents become, the more cycles that it will take to dry clothes. These repeated cycles cause unnecessary wear and tear on appliances. In a multiunit property, appliances go through far more loads than they would in an single-family home. Professional services do more than clean your dryer, they extend its lifespan. 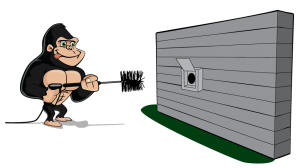 Choosing Gorilla Property Services for your Aldergrove dryer vent cleaning ensures that your duct system is professionally cleaned from top to bottom.